Home > INDUSTRIAL > Technology (Industrial) > What is Micro Seg Flow? What is Micro Seg Flow? 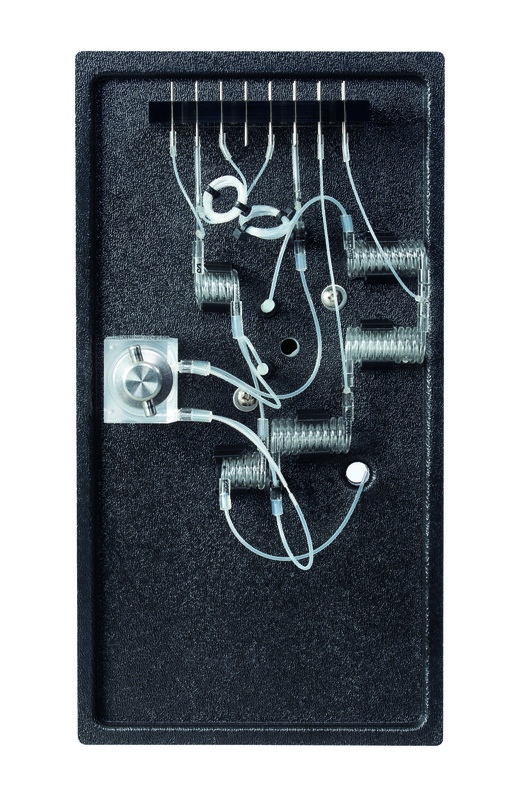 Leonard Skeggs, PhD, invented the first continuous flow analyzer back in 1957. 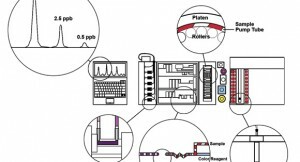 With that invention and with the eventual development of the first Segmented Flow Analyzer (SFA), a revolution took place in wet chemistry analysis: Many labor-intensive tests could now be automated, thereby increasing a laboratory’s testing capabilities without the need for more personnel and supplies. As a result, hundreds of wet-chemistry methods were converted over to durable and reliable SFA. The initial SFA systems were limited, however, and slow when compared to other technologies that followed. And although these first systems provided a considerable advantage over doing tests manually, faster and more sophisticated technologies began to appear and phase out the older systems. Of course the problem with many of these newer technologies (i.e. FIA) was that many laboratories would often have to sacrifice detection limits for speed and automation. The Astoria and Astoria2 analyzers provide the modern laboratory with three advantages: (1) they have the detection capabilities of SFA, (2) they use far less reagent than both FIA and older SFA (~1/10th the reagent), and (3) they take up much less bench space (~1/3 less space). Essentially, the differences are in the design: Astoria’s systems are micro-SFA. This means that the Astoria and Astoria2’s analysis rates are nearly twice as fast as older SFA systems and use a tenth less reagent! 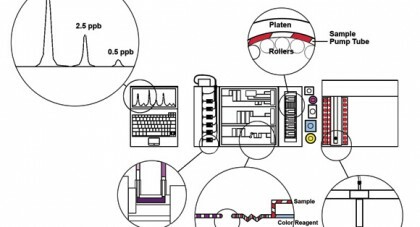 Five primary components make up a micro-SFA system: (1) Sampling device, (2) peristaltic pump, (3) reaction cartridge, (4) colorimeter (or a detector of some type), and (5) data acquisition software. When a RUN is started, the sampling device–working in concert with the peristaltic pump–pulls some sample (based on time in the cup) from a cup or test tube. The peristaltic pump moves that sample, along with specific reagents of a particular method, into the reaction cartridge. The reaction cartridge, which consists of injection fittings, glass mixing coils, heating units, etc., combines sample, reagents and air-segmentation bubbles into the reagent stream. In the reaction/analytical cartridge, a detectable product is formed (e.g. for HexChrome analysis) it flows through a photometer, which uses a filter at a specific wavelength (e.g. 540nm) for that analysis. 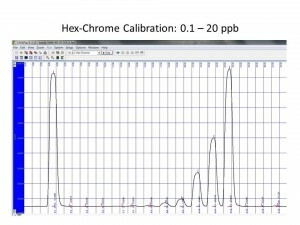 To determine the concentration of the analyte in the sample, the intensity of the color formation is directly proportional to the concentration of the analyte (HexChrome as the example), which is determined by first running a calibration curve of known standards and comparing the collected sample data against that curve. The data acquisition and control software (FASPac2 for Astoria/Astoria2 analyzers) processes the information and allows the operator to analyze the resulting reports, and also controls the various functions of the sampling device, peristaltic pump, and photometer(s). 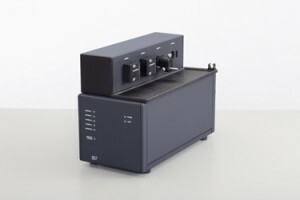 Astoria’s micro-SFA systems allow the lab to run between one to seven parameters at the same time, depending on how many channels or number of detectors the system houses. Most often, the lab will run 1 – 3 channels; however, a few laboratories run anywhere between one to six methods (i.e. Nitrate, Nitrite, Ammonia, OP, Silicate and Urea in seawater) simultaneously. 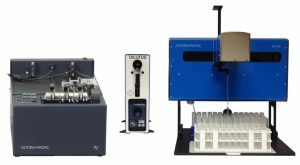 In contrast to Discrete analyzers, the Astoria and Astoria2 are ideal units for labs that have only a few tests to run but have a lot of samples. Micro-SFA is also a good platform for alternative methods of analysis that use in-line dialysis, in-line distillation and/or UV digestion, fluorometry, UV detection, flame photometry, etc. Consult with an API representative to determine the best automated platform (micro-SFA or rAPID-T Discrete) for your laboratory. What computer specifications are required for FASPac2? Will I need to buy a computer? What information can be included in the reports? What type of QC is available in your data acquisition software, FASPac2? What auto shutdown/startup features are available with an Astoria? What software tool does the software use to make on-line standards prep? Why don’t you have smart or intelligent dilution? What dilution ratios can you accommodate? 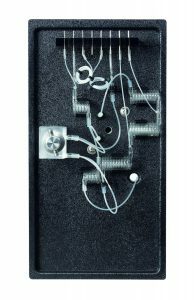 Do you offer an optional diluter module? How many analytes can you determine simultaneously on an Astoria? Can I use some of the components of my current system with an Astoria? Can I trade-in my old analyzer for a new Astoria or Astoria2 Analyzer? Is it really cheaper to buy, own and operate an Astoria rather than FIA? Are you a Global corporation? Do you use US.EPA and/or Standard Methods? Who or what is Astoria-Pacific International?